This is the fourth in a series of videos culled from an interview about content marketing I did with Terry Foster of Cision Canada. Cision (the USA version) is also a sponsor of Convince & Convert and our Social Pros podcast. (here’s a post I wrote about their nifty content amplification tool). Terry: So where do you think content marketing fits in the paid, earned, and owned media mix? Jay: Well, it actually has sort of hooks into all of it, right? On the paid side, you almost have to use paid amplification in many cases now to get your content out there. Certainly owned is essentially what content marketing typically is, and if your content marketing is good enough and useful enough, then it really can trigger this enormous earned coverage. In fact, I would say that many of the most successful content marketing executions now are successful because they triggered an earned media wave behind them. Terry: Do you think content marketing is a real platform for brand disruption? Jay: I think it can be, but I don’t think we’re there yet in most cases. Most of the content marketing success stories are an experiment gone well, which may result in some brand disruption, but it’s not consistent enough or strategic enough to really be there yet. But I think in the next couple of years, 100% yes. Terry: Do you think brands could be less predictable when it comes to creating content and sharing it? Jay: No doubt. I think it really helps brands to be more relatable with content. But what that really requires, it’s not so much about marketing execution or marketing acumen. It’s about corporate culture. All the consulting work that I do really is rooted in culture first and content second. If you’re not culturally ready to create content that isn’t about your brand, that is in fact useful or interesting, it doesn’t really matter how good your infographic, or your eBook, or your video, your anything else is because you don’t really believe it. It’s not truth. Terry: What do you think the balance has to be between curation and creation of content in a content marketing program? Jay: Yeah. It’s an interesting question, and I think there are going to be more and more sort of opposing forces around that creation versus curation question. I really believe you have to have both. That while creation is typically more efficacious, you’re going to get more out of it because you have more control by definition. It’s really, really difficult to create everything in your content program. Content ain’t free. Far from it. It’s difficult and time consuming. So if you can have a creation program that has really interesting content, sort of tent poles, and then fill in around them with a really strong curation program, I think that’s the best case scenario. I also talk a lot about cooperative content, about creating content in cooperation with your customers and/or your employees. 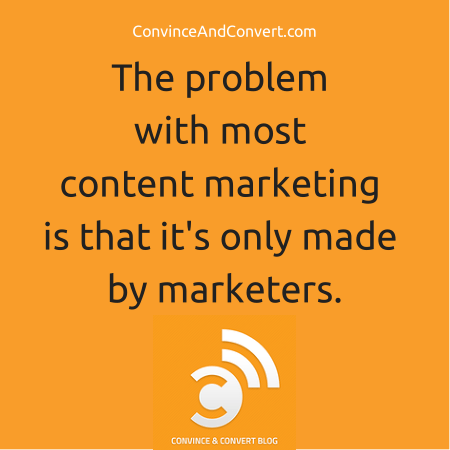 The problem with most content marketing is that it’s only made by marketers. Everybody who works in your company has knowledge that your customers can benefit from. One of the best ways to do content marketing is to set that knowledge free.